1. In your Dyn Remote Access account, go to Account Settings and find your Updater Client Key. If the Updater Client Key field is blank, click Generate Key. 2. Locate the file DynUpdater.msi on your computer and Double click the icon to run it. Note: If you’re not logged in as an administrator, you may need to right-click DynUpdater.msi and select Run as administrator. 3. 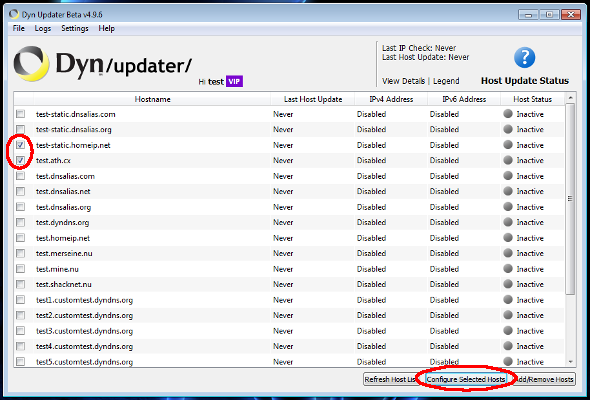 Open the Dyn Update Client from your system tray and click Add Account. Enter your Dyn account username and use the Updater Client Key as your password. 4. Click the check box beside your one of your hostnames, and then click Configure Selected Host. 5. Ensure that Automatic is selected from the IPv4 Configuration drop-down menu,and then click OK. Your hostname will automatically be updated when your IP address changes. IPv6 Configuration: The option you select here controls how the IPv6 record of your hostname is updated. IPv6 and IPv4 records can co-exist on a hostname, allowing whoever is connecting to the hostname to use what protocol is available to them. IPv6 is the newer, less common, IP address protocol in use. If you do not have IPv6 connectivity through your ISP, you should disable this option to avoid updates not occurring. IPv6 addresses look like 2600:200f:1:1234:abcd:ef12:3456:789a. Automatic: This option uses the address on which your machine connects to the public Internet, as seen by a remote server. This is the most commonly desired configuration. Disabled: Do not create a record for this IP address protocol when sending updates. Disabling both protocols disables all updating for a hostname. Local Interface: Provides of a list of interfaces to choose from when selected. When sending updates, this uses the first IP address found on the specified interface. This is useful to update a hostname to an internal IP address of a machine. Static Address: Provides a text field to enter an address when selected. When sending an update, this exact address is used for this IP protocol. This is useful to have one IP address protocol detected automatically in some way, with the other set to a specific address always. Once you have corrected the source of the critical error, you may click on View Details followed by Retry update to reset the Updater.